Five international teams of astronomers studying data from Hubble's new infrared camera, the Wide Field Camera 3 (WFC3) have unexpectedly found that the density of galaxies in space decreases with distance. 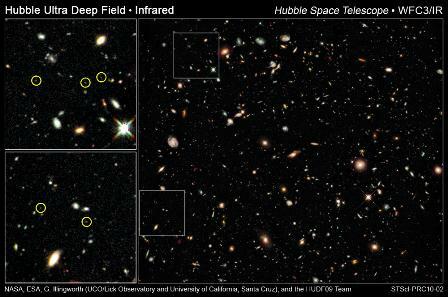 The camera was pointed at the same patch of sky as the Ultra Deep Field, an image taken by Hubble that is the deepest visible light image of the universe. The new camera was able to make deep exposures to uncover distant galaxies at roughly 40 times greater efficiency than its earlier infrared camera that was installed in 1997. The WFC3 brought new infrared technology to Hubble and accomplished in four days of observation what would have previously taken almost half a year for Hubble to accomplish. The deeper astronomers look into space, the farther back in time they can see, because light takes billions of years to cross the observable universe. This makes Hubble a powerful "time machine" that allows astronomers to see galaxies as they were 13 billion years ago. Assuming the Big Bang theory is true, this would mean they existed just 600 million to 800 million years after the beginning of the Universe. The teams are finding that the number of galaxies per unit of volume of space drops off smoothly with increasing distance. A serious problem with these findings is that it still appears that these early galaxies did not put out enough radiation to "reionize" the early universe by stripping electrons off the neutral hydrogen that cooled after the Big Bang. This "reionization" event should have occurred between about 400 million and 900 million years after the Big Bang, but astronomers still don't know which sources of light caused it to happen. These new galaxies are being seen right in this important epoch in the evolution of the universe. The astronomers think that perhaps the density of very faint galaxies below the current detection limit is so high that there may be enough of them to support reionization. Or there was an earlier wave of galaxy formation that decayed and then was "rebooted" by a second wave of galaxy formation. Or, possibly the early galaxies were extraordinarily efficient at reionizing the universe. Due to these uncertainties it is not clear what type of object or evolutionary process did the "heavy lifting" by ionizing the young universe. The calculations remain rather uncertain, and so galaxies may do more than currently expected, or astronomers may need to invoke other phenomena such as mini-quasars (active supermassive black holes in the cores of galaxies). Current estimates suggest, however, that quasars are even less likely than galaxies to be the cause of reionization. This is an enigma that still challenges astronomers and the very best telescopes. "As we look back into the epoch of the first galaxies in the universe, from a redshift of 6 to a redshift of 8 and possibly beyond, these new observations indicate that we are likely seeing the end of reionization, and perhaps even into the reionization era, which is the last major phase transition of the gas in the universe," says Rogier Windhorst of Arizona State University, leader of one of the other teams that analyzed the WFC3 data. "Though the exact interpretation of these new results remains under debate, these new WFC3 data may provide an exciting new view of how galaxy formation proceeded during and at the end of the reionization era."